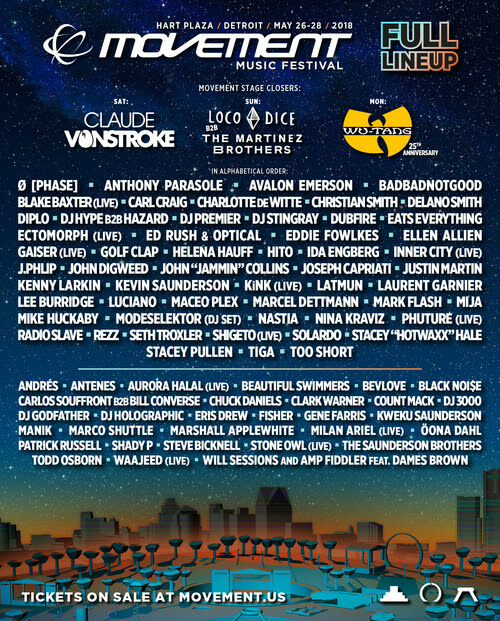 Movement Music Festival, one of the longest-running and most-acclaimed music festivals in the world, is excited to announce the full lineup for 2018, led by Movement Stage Closers: Dirtybird boss and festival favorite Claude VonStroke, a rare b2b performance by Loco Dice and The Martinez Brothers, and a special performance by all nine members of the Wu-Tang Clan celebrating the legendary hip-hop group’s 25th anniversary and their classic debut album Enter the Wu-Tang (36 Chambers). Detroit’s annual three-day revelry returns to Hart Plaza on Memorial Day weekend, May 26-28, 2018. Movement 2018 3-Day GA Weekend Passes and 3-Day VIP Weekend Passes are now available for purchase at www.movement.us. Payment Plan options are also available. Previous Post 2018 Weekender Lineup with King Britt, Hyenah, David Harness, Nickodemus, Doc Martin (Sublevel), Eli Escobar, Julius Papp, Oscar P, Cris Herrera + a Drum & Bass Stage & more!